Every morning I walk my nature trail and observe the differences that each day and each season bring. During the summer I have to carry a spider stick (a long stick that forks at the end) to gently lift the new spider webs that have been created over night on the trail. Yes, I could just destroy them because it is my trail and they are blocking my path. But in truth, it is ‘their’ trail, and I am the trespasser, so I use my spider stick to carefully lift the web over my head, and pass under. This time of year, I do not have to carry my spider stick. 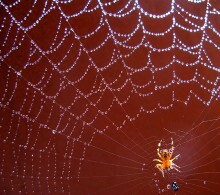 The cold temperatures seem to discourage web making. Is it because there are so few flying insects to catch? Where do all the spiders go this time of year? I am not really sure, but I have to say that I have great admiration for the spider that does brave the cold to spin a web. I wonder about him (her?). The general consensus among spiders in October is that it’s time to quit, to give up, take a rest, cuz it ain’t worth it! Still there is always that one spider that will go to the trouble. And, ‘this’ hiker takes notice, and respects the effort. 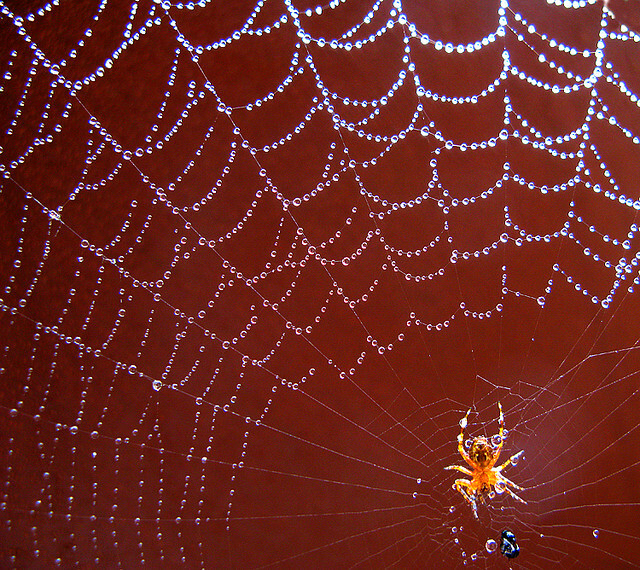 What does it mean to “die in your web”? I think it means to die, living. To the CF teen, it may mean carting around your oxygen tank to the country fair. To another it is about anticipating the birth of your cat’s kittens. To another finishing up chemotherapy, it is planning your mother’s birthday present. To the young man too weak to walk now, it is pimping out your wheel chair. To the 22-year old in transplant housing it is meeting up with Streetlight friends for a movie, while waiting for the heart that hasn’t yet come. There is a despair that comes with the chilly autumn news of a relapse or low PFTs. It is tempting to crawl under a bush and just let the cold set in. It takes courage to wake up and do what you always do, or what you want to do, despite the cold. To attach your thread to the nearest branch and swing out into the cold morning air and keep spinning. It takes courage to keep going when it looks like you may not win. These are the brave young people we befriend. We may think we understand them, and we try, but let’s face it – we are spinning webs in the heat of July, on a path swarming with prospects and success. They are spinning the webs in which they will die. That takes a very special effort…and very special friends.